scott hunter | CWA shortlisted author of crime thrillers . . .
CWA shortlisted author of crime thrillers . . .
Scott has been recently reading . . .
Diary of an author – eBook, Paperback or Audio? Cards on the table. I love paperbacks. New ones. The smell, the feel. The glossiness of the cover (or mattness – is that a word?). I love being in Waterstones, or any bookshop really, WH Smith being the exception (they don’t know what they are at the moment, do they? Bookshop? Fast Food outlet? Bric-a-brac shop?). Bookshops with ambience. That’s what I’m talking about. I can spend hours in bookshops – spend, not waste, note – and I’m still bemoaning the closure of Reading’s best bookstore, Waterstones, in the Oracle. Why did it close? It was a perfect bookstore; lengthy, walk-through (you had to walk through it to get anywhere in the Oracle – well, I had to anyway), well laid out, friendly staff. It even had a Costa, for goodness’ sake. I mean, what more do you need? Now we’re left with the Waterstones in the main street. It just doesn’t have that same vibe. I don’t know why. Anyway, I digress. Paperbacks, they’re the thing. Yes, I sell eBooks as well as paperbacks, and the format is very popular. They’re handy, friendly on the purse/wallet, and eminently practical. It’s not that I don’t like the eBook format, it’s just that, given the choice, I’d always go for the physical version, not the electronic. The powers that be tell us that the paperback is enjoying a resurgence, and that eBook sales are in decline. I think that we’re finally getting a natural balance between the two. Audio is a different kettle of fish. For me it all depends on the skill of the narrator. If I like his/her voice, no problem. If not, it’s an instant switch-off. A few of my novels are available on Audio, and wow, what a great job the narrators have done! It’s amazing how the right voice can bring a story to life. 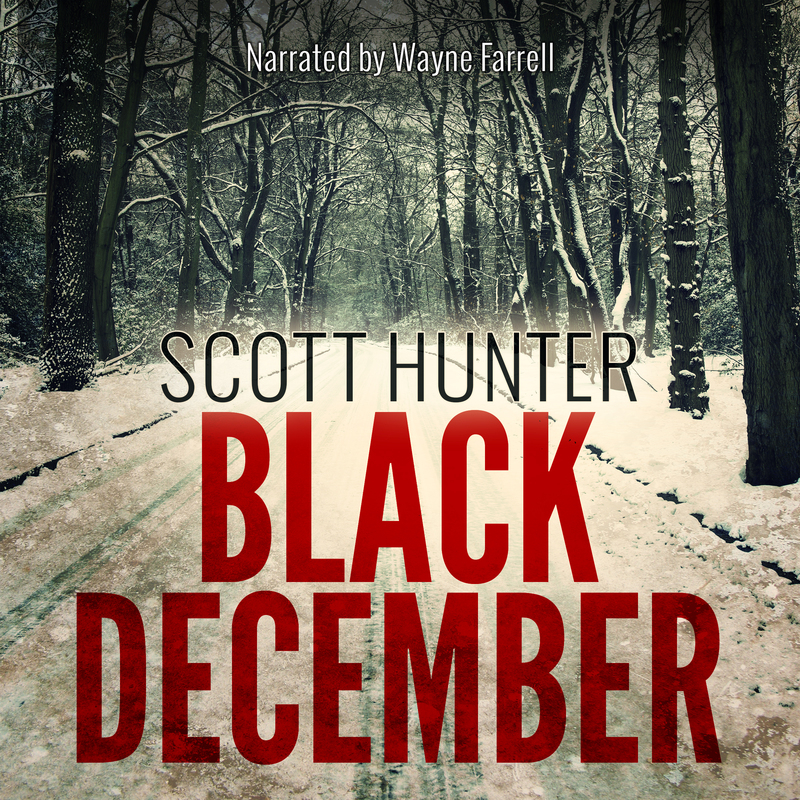 Wayne Farrell, my narrator for the first DCI Brendan Moran novel, Black December, almost epitomises the way I heard the detective speak in my head as I wrote the book. Have a listen. Audio is great for car journeys, and pretty good for an alternative to TV if you’ve watched too many Emmerdales in a row. You have, haven’t you? Look, it’s no use denying it. Help is available, but you have to want to kick the habit yourself, OK? Diary of an author – wait a bit, want it now? So now I’m told that, in the new world of agile authoring, I must produce three books a year. Or more, if possible. It’s possible, but is it beneficial? Author Jonathan Kaye completed his debut novel, After the Affair, in three years. He laboured over it, perfected it. I’ve not read it yet, but I probably will. There’s something appealing about a guy willing to put in so much effort, to make his novel the very best it can be. I know, I know, there are authors out there who seem to churn out novels as if they were some mass-produced commodity. And I’m not saying they’re bad books. They’re probably very good. But could they have been better, given a little more time and love? I can’t imagine JRR knocking out the final draft of Lord of the Rings in four months, and still enjoying an avid readership over sixty years later. Can you? I’m willing to bet that Rohinton Mistry’s novels take a bit longer than four months apiece as well. So, has the artful business of novel-writing also fallen foul of the ‘must have it now‘ social-media generation? It takes me around twelve months to finish the first and second drafts of a novel. Am I too slow? I guess I’ll make less money than the three-times-a-yearers, but then again I’m not in this exclusively for the money. Sure, it helps, but for me it’s more about the craft itself than the remuneration. So what do you think? Are you happy to purchase a novel dashed off in a few months, or are you likely to be more discerning? Speed, or quality? Which wins? Morse has his opera. Banks has a wider repertoire of taste: everything from Miles Davis to classical, to the Grateful Dead. Is music important in a novel? As a musician myself (I’m a drummer – hey, no drummer jokes, OK? 🙂 ), I was a little surprised recently when I realised that music isn’t strongly represented in the DCI Brendan Moran novels. I thought about this for a while and came to the conclusion that music and musicians, especially contemporary music/musicians, are rarely portrayed with any degree of accuracy in modern crime fiction, be it TV drama or literature. And I think that’s why – at least so far – I’ve been cautious about introducing musical elements into the storyline. OK, so I know what makes musicians tick, but it just seems to me that when, as an author or scriptwriter, you try to capture some kind of musical zeitgeist, it all goes horribly wrong. Case in point. I remember watching an episode of a TV crime series (which I shall charitably keep anon.) in which a group of old sixties musicians were getting back together (or ‘trying to get it together, man’) for a reunion tour. It was horrendous, ghastly and stereotypical. Every cliche in the book (‘scuse the pun) was trotted out. The musicians all spoke in quasi-stoned pseudo-hippy language that, frankly, made me shake my head in disbelief. The writer clearly didn’t know much about contemporary music, especially the minutiae of how a band functions in everyday life. The episode quickly degenerated into a wildly exaggerated and unbelievable pastiche. The wigs were hilarious, though. I’m thinking about this as I write. Music is a soundscape for our current situation in life, isn’t it? Time and place is recalled, often with great intensity, by the opening bars of a favourite song, or a faintly-discerned chorus left behind in the slipstream of a passing car. I can’t listen to certain pieces of music because they’re just too evocative, too nostalgic. And that might have a bearing on my reluctance to apply a little musical colour to my novels. One person’s happy memory may recall another’s lowest point. And whichever way the reader reacts, the musical intrusion could end up being just that – an intrusion. As authors we want the reader to be glued to both character and plot, with no distractions. Hm. So, perhaps I could invent a favourite musician for my main character? But why stop there? I could invent a whole string of violin concertos, or a completely fictitious top 20 chart. Without Kanye West. But then that wouldn’t ring true with the reader, either. I think the answer is to aim down the middle. Maybe keep your characters’ tastes fairly general. I have a friend for whom the sixties seemed to have passed by without a note of music being played or heard. He’s simply not into music at all. You can mention Woodstock or the Beatles and he’ll be with you, but deviate from the big names and he’s immediately lost. Gentle Giant? New Riders of the Purple Sage? Atomic Rooster? Forget it. Yep, aim down the middle, I reckon. Keep the novel’s musical backdrop unobtrusive but gently atmospheric. That’s the way forward. In other words, no sharps or flats – just a good stereo balance. Today’s little known musical fact: There’s no chorus in REM’s Losing My Religion. Q. How can you tell when a drummer’s at the door? A. He doesn’t know when to come in. So, here’s a short bit from the novel in progress, ‘Silent as the Dead’. An armed gunman is stalking a young girl in an underground car park. Outer doors are locked. Two cops outside. Backup (ARU) running late. What do they do? DC Bola Odunsi was a good cop and he knew it. He’d had a few wobbles, sure, particularly after DS Steve Banner’s murder and the ensuing DCI Wilder debacle, but he’d got over that. He was on the good guys’ side now, and proud of it. He and Tess worked great together and Bola had a lot of time for his tenacious, sassy partner. Thing was, there was an armed guy in the building and his sense of … well, rightness, wouldn’t allow him to rank Tess lower than himself in the safety and due diligence stakes. That meant she stayed outside while he went in for the girl – if there was a way in. But it wouldn’t be easy. Tess wasn’t one to hang fire and he’d have to insist. They were standing at the rear of the apartment block, by the concrete ramp which led to the electronic car park door. ‘Then we check with the boss.’ Tess thumbed her radio. I suffer from that annoying condition called bruxism – where your teeth clench involuntarily during the night, rather like the Clashing Rocks (The Symplegades or Planctae?) which tried to crush Jason and his merry bunch of Argonauts during their quest for The Golden Fleece. Sometimes my tongue fills in for Jason and his crew and blood is spilled. It’s annoying to say the least. The other problem, apart from potential tongue injuries, is the headache which greets me after a particularly bad night of unruly clashing. It’s not a headache as such, more a skull-ache. Painkillers don’t touch it and the only thing to do is get on with the day and let it fade gradually (or not, as the case may be). And so, it is with imaginable joy and delight in my heart, dear reader, (yes, and head) that I sit at my desk this grey morning in the Royal County to continue writing ‘Silent as the Dead’. But lessons can be learned from infirmity, right? Jason could either have set course for Scylla and Charybdis, the legendary sea monsters, or the Clashing Rocks. Not much of a choice. From Jason’s dilemma we gain several colloquial idioms: having to choose between two evils, between a rock and a hard place, between the devil and the deep blue sea, and many more. So Jason was going to face difficulties whichever direction he decided to sail. Writing is a bit like that. Should the plot move this way, or that way? If that way, then what happens to X or Y? If this way, then Z needs to be revisited and rewritten. Anyway, Jason got some unusual help in the end. A bit of a Deus ex machina situation if ever there was one – I mean do gods really rise from the deep in real life to save us from danger? Am I to expect a tap on the window from Hermes this morning? That’s a whole new question and this is turning into a Ronnie Corbett story so maybe it’s time to stop. Don’t worry, my bruxism isn’t due to my being an author. Writing isn’t that stressful. Characters – more important than plot? I find myself returning to favourite books I’ve read – sometimes often – and which I therefore know very well. It’s not that I want to relive the story necessarily, although that might be part of it. No, the main reason is that I want to spend time with the characters. I want to renew old acquaintances, to enjoy their company once again. I want to row serenely down the Thames with J and Harris and George in that timeless classic, Three Men in a Boat. I want to laugh at the old jokes and situations, follow Harris around the Hampton Court maze as he leads a gaggle of bewildered day-trippers round and round, always ending up at the centre. I want to hitch a ride with Paxton and O’Neill in their flimsy WWI aeroplane in Derek Robinson’s brilliant air drama, War Story. I enjoy meeting up from time to time with my friend Gustad Noble, as he performs his early morning kusti in the Khodadad building’s compound; Gustad is one of my favourites – he’s absolutely real to me. So all credit and much kudos to the brilliant Rohinton Mistry for introducing me to Gustad, even though time and considerable distance (plus the fact that Gustad never really existed) will always separate me from the Noble family. This last novel, Such a Long Journey, is for me a definitive work of characterisation. I feel such empathy with Gustad and his many difficulties. With each turn of the page I experience more of the heat and tense atmosphere of this fictional but true-to-life nineteen-seventies India, as it struggles to survive under the crushing weight of Indira Gandhi’s turbulent rule. I love Gustad for his indomitable spirit. He doesn’t get everything right – indeed much of the time he gets it very wrong. But that’s life, isn’t it? I love his flaws, not just his better side. He’s a good guy to spend time with. So when I’m writing, I try to be mindful of this. Good characters are complex, contrary, sometime unpredictable, always fascinating. Even the minor roles should be memorable. My protagonist, DCI Brendan Moran, is a very interesting guy. His background is unusual and nothing in his life is particularly straightforward. Moran’s colleagues also struggle with various burdens and difficulties – but it’s how they deal with these which makes for an absorbing and page-turning read. Like Gustad Noble, I may not always get it right, but that’s what I’m aiming for when I’m putting a novel together. Well-drawn characters are a mirror to our own souls. In their daily struggles we see possible versions of ourselves, and thereby find answers to the problems and difficulties each of us face in an increasingly dangerous and unpredictable world. This site discusses creative writing, art, and topics of interest to readers and writers.